These Acrylic coasters printed from the Umbrella Series oil paintings and the Small People series make perfect gifts. They come in sets of four different images and are far removed from the usual cork backed coasters of yesteryear! These modern pieces are a must for the contemporary dining room table, restaurant or hotel. They are available online and in various stockists in East Anglia. 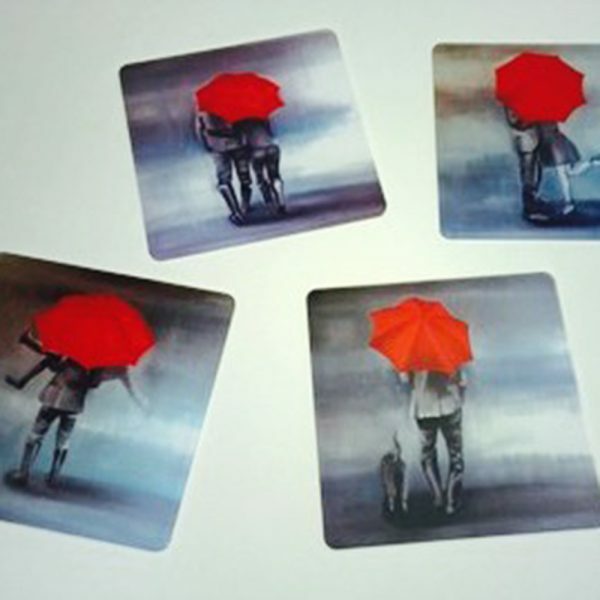 These Acrylic coasters are printed from the artists original ‘Umbrella Series’ oil paintings. They come in sets of four different images and are modern in design and finish making them a must for any contemporary dining room table, restaurant or hotel. They are available online as well as in various stores across East Anglia. Please contact the artist directly if you have any further questions about the coaster sets.